Well, riding @CommuterLine is fun, but there are some rules for bringing luggage and folded bike. Basically, the folded bike can be brought inside the train. It is happy news indeed for people using a bike. Just remember only folded bike, otherwise you should park your bike in the station. What about luggage? People using intercity train can bring their own luggage inside the @CommuterLine train. The luggage maximum size is 100 cm x 40 cm x 30 cm. By the way, the electronic gate is not quite friendly even to a passenger with only one luggage. It is uneasy to pass the electronic gate with your luggage in hand. 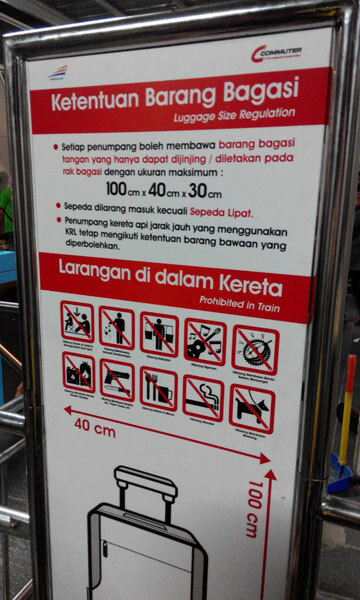 Well, this luggage rule is not really applied, especially in Tanah Abang Station. If you take the @CommuterLine in Tanah Abang station, you will see many women bring a larger luggage. Sometimes the luggage is bigger than the person itself.